Select the type of door required. Add FG, UG, FS, SC as suffix to hood model number. Supplied with (4) doors on (2) tracks, doors slide horizontally in an overhead track assembly. A threshold is not required, allowing equipment to be easily rolled into the hood. A floor plate 0.25" high serves as the guide for the doors. 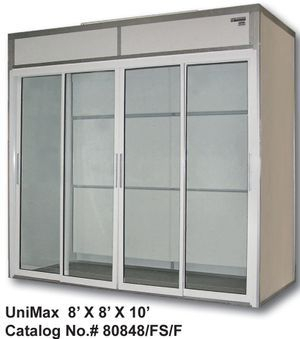 Framing is of clear anodized aluminum and the glazing is of 0.1875" thick safety tempered glass or clear acrylic. Overhead trolleys move very easily and all hardware including handles are provided. Air inlet slots are located at the base and top of each door. Supplied with (4) doors on (2) tracks, doors slide horizontally in an over head track assembly. A threshold is not required allowing equipment to be easily rolled into the hood. Floor guides are provided to keep doors in proper positions. The glazing is of 0.50" thick safety tempered glass or clear acrylic. Overhead trolleys move very easily and all hardware including handles are provided. Air inlet slots are located at the base and top of each door panel. Supplied with (4) doors on (2) tracks, doors slide horizontally in a lower floor track. The floor track threshold is 0.75" high. The glazing is of 0.25" thick safety tempered glass or clear acrylic. Doors slide on lower rollers and all hardware including handles are provided. Air inlet slots are located at the base and top of each door panel. Clear vinyl strip curtains provide containment in addition to the ability to move drums, cylinders, or equipment easily through for processing or storage. Curtains are .040 mil thick with typically a 2" overlap. Curtains mount and suspend from an overhead track that allows convenient removal for changing or decontamination. Curtains hang to within 6" above the floor, however, depending on the airflow volume, the gap may be greater or less. Static dissipative, colored, or opaque curtains are optional.